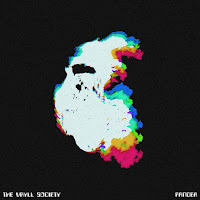 It's with some excitement that we approach The Vryll Society's debut EP Pangea. Coming on the back of their two taster tracks Deep Blue Skies and Beautiful Faces and some psychedelic out there shows that left band and audience in a trance, the EP is the sound of The Vryll Society laying down their marker for 2016. Pangea is a triumphant piece of work, it's a record that creates a vibe and atmosphere throughout and that's where The Vryll Society stand out from the crowd so early in their career. Two of the tracks on the EP, opener Coshh and final track The Egg are pieces of music rather than songs and they take you on a transcendental trip through beautifully crafted sonic peaks and troughs. Such forays are not always successful, but they pull it off and then some both times as there's an articulate intuitive feel to both songs that envelops the listener. They pitch both just right, dreamy guitars and electronics abound and Michael's hushed scurrying vocals feel so insistent as he implores that "Jesus loves you" on the former. It's impossible not to be drawn into the whirlpool of love that they've created. Air starts off like a languid jam session with Michael exclaiming "Air" repeatedly and it sets the tone for the rest of the song. The structure feels so loose and natural that you could imagine it coming to them fully-formed in a jam session, exploring different avenues as it progresses. Metropolis feels more structured as it opens with a simple drum beat and Michael's vocals, building slowly to an euphoric epiphany before dropping back down with them never coming close to relinquishing control or our attention. Pangea is an EP that retains the feeling that it's almost effortless throughout with a instinctive fluidity, a sense of something out of the ordinary, that "space rock sorcery" that Deltasonic's sadly-departed Alan Wills identified in them. It might feel a little light touch in parts, but that's what is ultimately so magical about it - it's natural, a band in a groove, letting the music flow and carrying us all along with it. The Vryll Society are on Facebook and Twitter. Pangea is out now and can be purchased here.